Richmond Craft Mafia’s NEW WEBSITE! Home / Richmond Craft Mafia’s NEW WEBSITE! I’m not sure if you all noticed any change around here, but we launched a brand new website this fall! We wanted a more cohesive online presence (remember we had not one, not two, but THREE websites plus a blog before?). 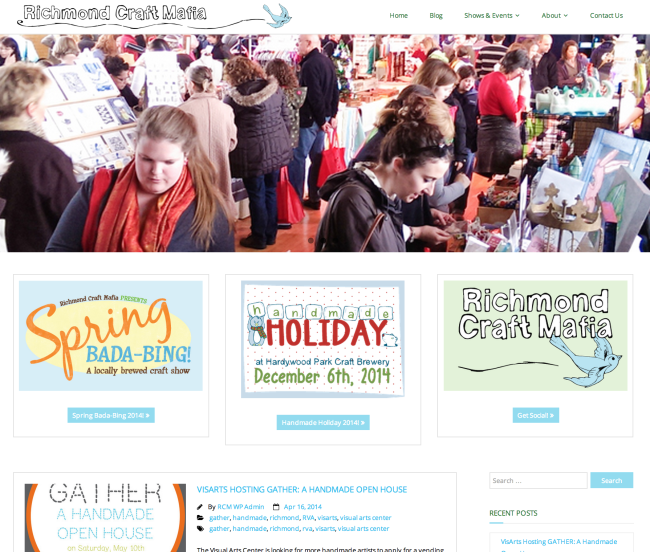 Well those complicated days are gone and now richmondcraftmafia.com is your one stop shop for Handmade Holiday, Spring Bada-bing, crafty meet ups, local info and more! We hope you like it! Oh and I wanted to give a special shout out to a few very hard working RCM members who really put in some extra elbow grease to get this website launched. Bri Bevan of Itty Bitty Press and Phil Barbato, master plush designer, went above and beyond the crafty call of duty on this one. If you see them at Handmade Holiday next month, be sure to give them an extra high five for all of their hard work! Speaking of Handmade Holiday, stay tuned to our blog for vendor sneak peeks coming soon! Shop early for a good cause (or two)!